Juba, May 21, 2017 (SSNA) — The World Food Program warned in its latest situational update that 5.5 million South Sudanese are facing a severe food shortage, citing lack of enough resources for May to July this year. 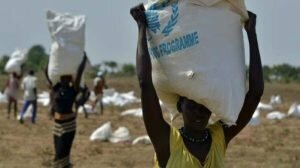 The latest update indicated that the number of South Sudanese who currently receive assistance from the WFP is 1.8 million. The report also said there are at least 2 million IDPs, 1.7 million refugees, and another 231, 537 people seeking shelter with the UN Mission in South Sudan. WFP further asserted that it has conducted a successful test airdrop of High Energy Biscuits (HEB), ready-to-use supplementary food (RUSF), water, blankets, and medical kits in Unity. Becareful of this man , he is very dangerous person , works under a company called Adabaji from Dubai as well as a Swiss company called GRUE .